Begin with a boat ride through “Tres Palos” lagoon as you observe nature and admire typical scenarios of the rural life of the population nearby. Afterwards, be welcomed as a guest in the exclusive Elcano Diamante beach club, get some rest and enjoy a delicious four course set menu. The Lagoon has exceptional natural beauty and exotic sceneries. Boat rides are offered to observe the different bird species that live at the impressive mangroves. The tour includes transportation with some refreshments available, tour guide, boat ride, access to private Beach Club, four course set menu with some drinks. You will be picked up from your hotel at 11am to head to the lagoon. There will be a stop for a snack at a restaurant (cost not included in the price. Continue with your tour to reach the lagoon and enjoy a boat tour there. The Lagoon has exceptional natural beauty and exotic sceneries. 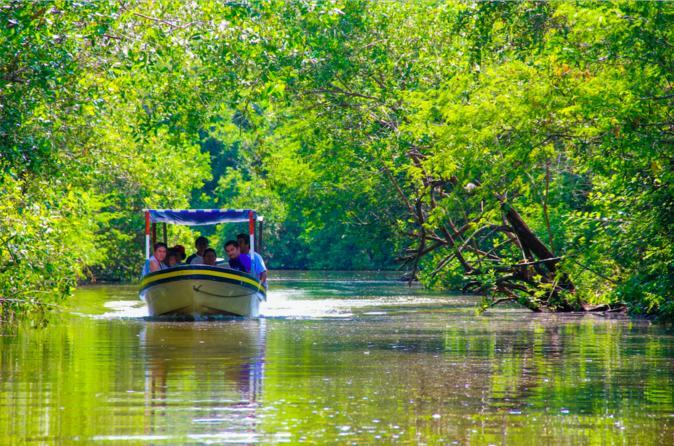 Boat rides are offered to observe the different bird species that live at the impressive mangroves. You will then be taken to the private beach club Elcano Diamante where you can spend some time there and use the facilities. Additionally, you will enjoy a delicious four course set menu (Mexican Platter, Cebiche or Paella) and dessert is a Coconut Ice Cream on Hibiscus sauce with walnuts. The menu includes two drinks (beer, soda, lemonade or bottled water). You will then be dropped-off back at your hotel.